AusGEMCO expertise is mostly in open pit mining for a wide range of commodities such as: gold, copper, coal, nickel, iron, lead, zinc, phosphate, bauxite and industrial minerals. We offer fees for consultancy services that can be based on an agreed percentage of the value we create for the customers. We offer a service for customized production scheduling optimizations to account for the specific features of any mineral deposit, mining and processing technologies used. This can be done with our core software PITFLOW written in Microsoft C++. We offer the most profitable method of open pit production scheduling optimization nowadays. We offer parallel deterministic and stochastic analyses of the technological and business processes as a way for assisting the decision-making process in the conditions of uncertainty inherent for any open pit mine project. We offer a chance to those mining companies, which experience mine planning problems with the generation of positive cash flows from current operations or with making marginal ore reserves into profitable ones. This study aims to illustrate a scheduling optimization of an open pit gold mine. The gold ore is presented by sulphide ore and low grade oxide ore in the upper pit benches. 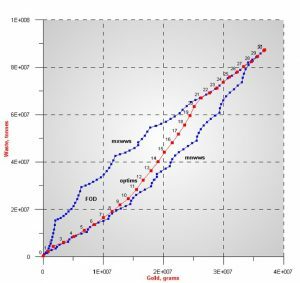 The cumulative spatial graph is shown in Figure 1 as a relationship between waste and gold product for the two extreme cases of the mining sequence arrangement – minimum working width sequence (mnwws) and maximum working width sequence (mxwws). Both sequences determine the feasible optimization domain (FOD) of mine sequence optimization. The optimum sequence (optims) generated is plotted in red colour and is located within the FOD. 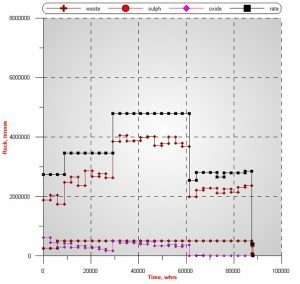 The optims is presented by 30 nodes equivalent to the time steps of the sequencing/scheduling optimization. The schedule of optims is shown in Figure 2 and it illustrates the schedule type with multi-stage stabilization of mining rate, which meets the mill production rate of 5.0mtpa regarding the sulphide ore. Oxide ore has some fluctuations and it can go to stockpiles for Heap Leach processing. In this particular case the schedule has 4 stages with a constant mining rate. The schedule is viable as it is suitable for mine-owner and contractor forms of mining.